Dear Blog readers, technical difficulties have prevented sharing our adventures todate, so from today I will begin to back date. For those wondering about whether we have heard Sydney airport is closing due to ash cloud ... You can probably sense our disappointment and frustration at the thought of having to be forced to endure this ongoing island paradise. Tuesday today and the day had begun with breakfast served to the villa ... NOICE!! In dribs and drabs we are swimming, walking on the beach, and investigating neighboring resorts. Apparently 'Fergie' was next door but one when holed up in KS during the wedding. THere is a mini zoo next door, so early mornings the tigers growling can wake up sleeping beauties. I can hear you all sympathizing - thank you. Mandy Hi Wendy What a fab way to be enjoying your not quite 50th b'day. 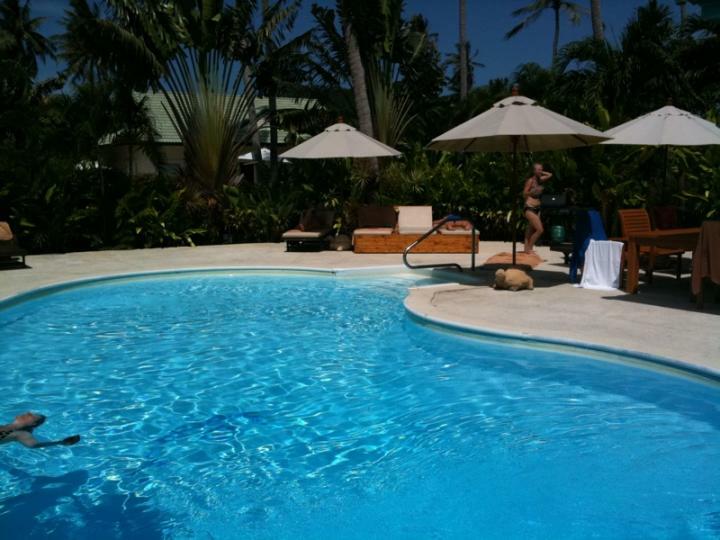 Told Chez before you left am very jealous especially when its freeeeezing in Syd. Life is good when you can share warm lazy days on the beach and balmy nights with friends and lots of drinkies. Oh yeh!!! You won't want to come home but before you do- you should all make plans for your next trip!!! Janet Bilton Hey girls, sounds like you are all having a great time. Have a drink for us. Michelle, don't forget to check out some snorkelling sites, can't go all that way to Thailand and not have a snorkel. See you soon xox. Hi there, just a work at the moment. Gee I miss you Michelle. Janet is a lazy arse. Have a good time. If you can't be good be careful.